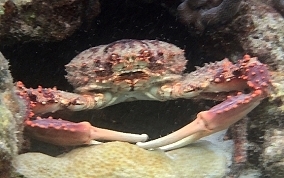 Also known as the Channel Clinging Crab, Coral Crab or Reef Spider Crab, the largest of the Mithrax crabs. Their carapace can reach almost seven inches in diameter. They inhabit reefs and hide in caves or recesses or under rocks ledges during the day. I was fortunate enough to see this specimen at around sunset. It was at a depth of about 6 feet. 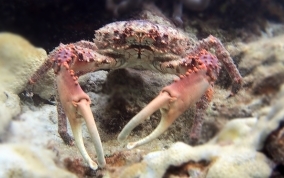 They are a True Crab and belong to the Spider Crab Family. 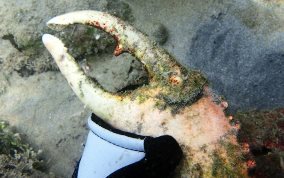 Their claw tips are shaped like little spoons.